I have been using TP-LINK TL-WR740N 150Mbps Wireless N Router in my Home to connect Wi-Fi devices. It is working fine for few months without any problem. I went on vacation for 7 days and when I back I noticed that my TP-Link router starting showing problem like Unable to resolve DNS Server when I tried to browse any websites. Initially, I thought it is a problem with my Internet Service Provider (ISP). So I contacted my ISP (BSNL) to fix this issue. The officer came to my home to see the issue and he told all our settings is fine, and we don’t have any problem with our end. He first thought there might be a problem with my modem itself (don’t get confuse modem with Router). And we changed that modem, but still, the problem persists. So he guessed there might be an issue with my router itself. This time we connected my Desktop directly from modem to LAN ports (wired connection). This time I didn’t see any problem on my desktop which is not using my TP-Link router to connect the internet. So we guessed the problem is with my TP-Link router. Now officer left, I started fixing this issue. Desktop: In my desktop internet is working fine. It is connected through LAN cable (wired connection) directly from the modem and not through TP-Link router. I’m not facing any problem here. Laptop: Here I’m using WiFi signals from TP-link router to connect the internet. Here in this device, I’m facing the problem. What Problem I’m Facing with TP-Link Router? 1. When I try to browse any website, at first those sites won’t open when I try to reload/refresh that page again It will open without any problem. I think it is some sort of frequent disconnection from the internet. 2. The response time from any site is really high, or I can say it is, when I try to open any site it took a lot of time to connect that site (you see below the browser it says “Looking for or Resolving… “ sort of messages). It almost takes 30 to 40 seconds instead of 2 to 5 seconds (used the desktop to check). 3. If you visit any website some images won’t load correctly, or you will see broken images, sometimes you will see “Unable resolve DNS..” sort of message on some widget. These are the problem which I faced when I connected to the internet with TP-Link router through Wifi (not tested with LAN cable). Even though I fixed this problem for a particular model like TL-WR740N router, I guess the process will work almost any company router or model. I have been trying to fix this issue for almost 2 days. I didn’t find any online resource to fix this issue, so I had to discover this for myself by trying various methods. Keep backup of your configuration settings before trying to attempt this method. 1. Tried to Reset the router to factory default by using Reset button which is found on TP-Link Router. 2. Clean setup by using Resource CD which is offered with tp-link router. Result: Most of the times works but sometimes didn’t worked. I think problem still persist. 3. I tried to change lot of settings/configuration individually by seeing others settings found on official forum. Then What worked for me? I was seeing “unable to resolve DNS” errors all around the web, that time I got an idea that there might be a problem with some DNS settings. So I looked for DNS settings in TP-Link router configuration. Then I found DNS settings in it. What I did was, I turned ON my desktop and looked for internet configuration by using ipconfig /all on command prompt. I specifically looked for DNS address. I did the same for my Laptop as well. I noticed my desktop DNS Servers IP and my Laptop DNS Servers IP’s are both different. So I decided to change my laptop or TP-Link router DNS settings. 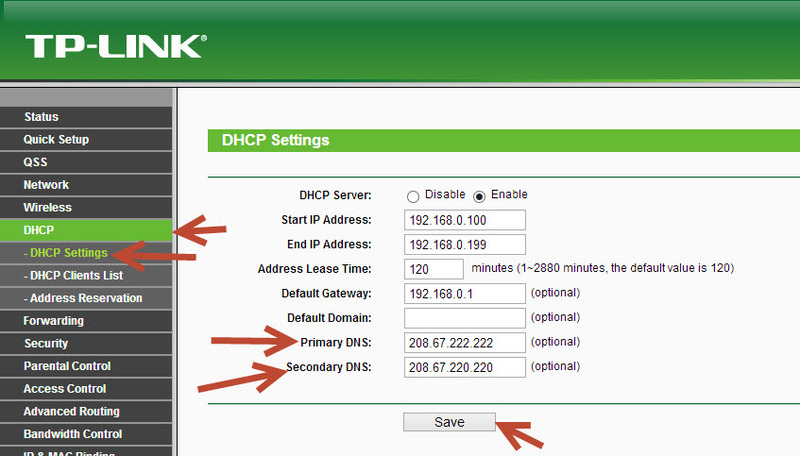 How to Change DNS Servers address in TP-Link Routers? To change DNS Servers IP address on TP-Link router configuration, visit http://tplinklogin.net/ or http://192.168.0.1/ while connecting to WiFi network. The default username and password will be admin so enter when it asked. Here you will see Primary DNS and Secondary DNS. In my case both are set to 0.0.0.0 that is the default value. I changed both the values to values which I got on my Desktop system i.e 208.67.222.222 and 208.67.220.220 (If don’t know DNS then contact your ISP, they will help you) and click save button after changing. Now it will ask for reboot, reboot it. This settings fixed my problem. If you have different problem then try to browse tp-link forum you will get some idea. If you have any doubts then leave comment, I will replay. If this fix fixed your problem then don’t forget to say thanks on comment. I’m also having the same problem. But in my case I’m could not able to save the settings after manually configuring the DNS servers in router. I mean nothing happens when click save button. Any help? Settings always go back to default. I am also having same problem, I recently change my password of my internet broadband and since it is PPPoE connection I required to enter username and password on my WiFi router as well. And when I entering the new password and click on save, there is no activity except page gets refreshed. Really really appreciate if someone help me in getting solutions. Try to re-install router software. I am also having the same problem. PPPoE connections is not getting established with the modem/internet. The page is getting refreshed after every 5 seconds but it is not getting the IP & Subnet Mask… Would be really helpful if some one give solution to this!!! I am using TL-WR841N. In my case I had to setup one static ip address for my desktop, after which the user DNS option started saving. What i should do now ?? You don’t need to have two DNS IP, sometimes it will have only one or nothing. Just follow How to change DNS server address and change that. You are a life saver, worked for me! Even changing DNS server settings I still persist same problems. Particularly Aliexpress.com site not opening at all. I am using net via Samsung notebook. router w740n of tplink. In my case, there is an opposite solution. I setted my router (LAN) gateway 192.168.0.1 as DNS server and it works. But my WAN has two DNS. It is interesting point, that same situation but different solution. Thanx Admin.. your last solution worked..
I’m having a strange problem. I have wireless connection and it is working fine but as soon as I plug in the same device with cable there is no internet connection just local network connection. I Tried hard reset and set up again but nothing works. I have the same router as you do. Tried various things but this worked for me, thank you so much!!! This was perfect, and what I’ve been looking for, for days! I had guessed that the issue was DNS name resolution and had already changed the default DNS server setting on my TP-LINK router from my ISP’s to Google’s public DNS servers (8.8.8.8 & 8.8.4.4), but the problem continued. When I followed these instructions and changed the DNS entries that would be served via DHCP, and then re-connected my devices, everything is working smoothly, quickly, and well. Thank you! This solved my bad internet problem!! Thank you so much!! 10. final step click ok…. oh should only use 1 DNS. you’re a life saver! thank you! In my case it was a problem with modem. All steps above didn’t help me. I had istalled modem Thomson TCW710. If I connect to it directly all works good, but as far as I use my TP-LINK WR740N had problems with resolving names. I tried Cisco router and faced the same problem. Thanks dude for sharing your solution with us. I am using the same router along with tp link td-8816 modem. I get this error frequently. Along with DNS error, random ads from ad.adsmatte.com pop up when I click anywhere on any non https websites. There is no adware on my devices as I have checked thoroughly. I don’t find such issues while connecting to other networks. Resetting my modem and router and resetting my browser fixes this issue. But somehow it returns after some days. Please help me fix this issue. In the DHCP> DNS enter one from your ISP that is given and the other use Google (8.8.8.8) or another reliable public DNS 4.2.2.2.
my laptop shows wifi is connected but i cant browse the internet. Recently I have purchased a tp link router and using bsnl broadband for internet. When i am using direct broadband connection i am able to open irctc website’ but when it is connected via tp link router unable to open irctc. When i am trying to open it shows the webpage is not available. I’m also having the same problem. But in my case directly connecting net is working but when we connect with router it showing problem. first 10 days it worked properly, later showing problems. every time i should login admin in tplink next i should login net profile. before when i installed router im given ip address , username and password. now it does not taking username & pwd. but main problem is i have to always login as tplink admin to access internet. I guess Router will have Reset button, try resetting it. Hi Arun, you just saved me! 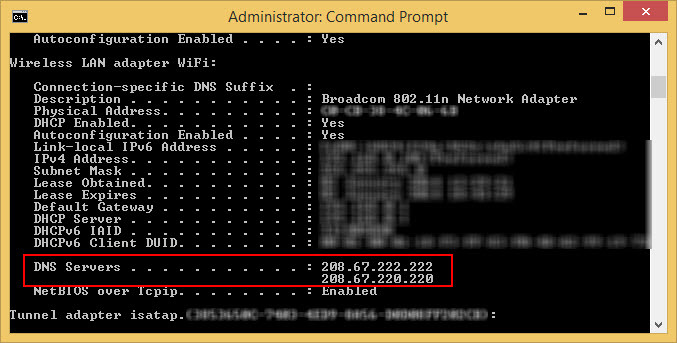 In my scenario, I just copy the DNS from the “Status” portion of router and paste it into the DNS settings. No need to find it from PC or laptop. Thanks for the solution! Worked for me. Good job, Arun. I have recently bought TP Link Router model TL-MR3220 and configured using Reliance Dongle. One LAN port is connected to CISCO router. The desktop PC which HP Pavillion All in one is able to access internet when dongle is connected to TP Link Router. However, the moment LAN is connected to CISCO Router, internet cannot be accessed either through wireless or through LAN cable when connected to Router from Desktop PC. This creates problem as the CISCO router is placed about 50 feet away and wireless signal from TP Link Router cannot reach that distance. Please let me know as to how this problem can be overcome. Is there any settings to be done in CISCO? However, smart phones can access internet irrespective of whether CISCO is connected or not. Trust you will suggest a solution so that the purpose for which this Router was bought is served. So, basically I spent 10 minutes reading all this story when actually you couldhave said the same thing in 2 lines. Thanks for taking my time.. I have a question. This DNS change takes effect just on my PC right? Then what about other devices that I connect with my router like my smartphone and tablet? plz help me how can i speed up my wifi inetrnet…is there any technical or DNS server related problem ? If yes, plz guide me step by step to solve this problem………….please reply me on email. Internet speed depends on ISP (Internet Service Provider) in your case BSNL, please check with them. Wow this resolved my issue too. I had to contact my ISP and they gave me 2 DNS addresses to input. Thanks for the knowledge and guidance. please check ur fb inbox…..
i have changes the DNS addresses and the wifi is working.Thank you Arun. Though i am unable to access the router through LAN from my PC. Can you please advise. I am unable to connect to wireless using TP-LINK unlimited network or no network connection. It works for me. The interesting moment, that laptop under windows 8.1. didn’t notice such problem, but with with notebook with Debian I had problem as you mentioned in you in your article. You solution helped me very well. I selected google DNS (8.8.8.8 and 8.8.6.6) instead of empty fields and all became fine. Then something is wrong with your mobile internet connection settings. Check on Mobile Net settings. I have a TP Link 3020 router. I use a PPPoE connection. The router suddenly disconnects from the internet, and it doesn’t work again until a reboot. What is the issue? I sent my device for a replacement and got a new one, but this also faces the same issue! No problem with a D-Link router with the same connection. my problem is to when i open the youtube on my laptop.i saw a error ‘DMS address not found’.i used tp-link router,but my wifi other member did not have any problem.there is only problem in my laptop. Please try changing your DNS Ip address on your router… also make sure your TP Link (whatever router) is receiving Internet connection first. Sometimes due to loose connection of internet on router you may won’t be able to use wifi internet. I have a separate problem but kind of similar. Here I can connect my laptop to DLink router and can brows internet but can not do from mobile , tab android as well as windows phone.From mobile its connecting to wifi router, taking user name and password but whenever trying for brows showing error DNS can not be resolved. I am using local cable internet connection. Router setup done with static IP and DNS set as provided by ISP. Tried so many settings change and rebooting the router but no solution till now. Please help me out. Certain settings like DNS do not get saved when we use Chrome or Mozilla browser. Try IE, Edge or Safari browser. I was unable to save DNS settings using Chrome and Opera tried with Edge browser on Win 10 and the settings got saved. I reinstalled the modem software using the CD they provided and now works. I suggest you to do this. Then, if this does not help try to change DNS and other stuff. It’s great. I follow your instruction and solve the same problem in my WR841N router. Thanks. I have i dps addres and this dont work!! I have spent hours trying to fix the same problem you described. I applied your instructions in my TP-Link router and now I have no more DNS problem. Hey man, I faced the same issue. I changed MUT size from 1480 to 1440 and all is well. But do you know the reason for this? Hey! I know I’m late, but I’ve been having this problem for months, and now the router decided to simply stop working at all. What fixed it for me was turning the DHCP server off (instead of auto or on), however I lost access to tplinkrepeater.net. I was having a DNS issue with WiFi clients too. Essentially the TPLink WiFi router provides DHCP addresses but unlike the DHCP addresses applied to Wired Desktops, the DNS Server IP is the WiFi router’s IP (it is providing Proxy DNS service to WiFi connectons). Desktops get 8.8.8.8 which I programmed into the TPLink DHCP configuration. So WiFi client connected devices like phones will stall out when trying to load a web page (mostly due to all the spurious Ad Content). It seems the TPLink router gets busy and ignored or delayed responding to DNS traffic. I had to manually configure DNS with 8.8.8.8 on WiFi devices. This was a little more insidious for Smart TV’s. They did not have any configuration options to receive a DHCP address and manually configure DNS. S I assigned static IP addresses to each SmartTV and configured DNS manually too. Performance is now rock solid. This issue was getting worse overtime and resetting the TPLink router did not help.